People will be coming together to re-enact the English civil war to highlight Scotland's involvement. The re-enactment event is will be hosted by The Sealed Knot, a charity aimed at commemorating history in a number of creative ways. Life in the 17th century for both the military and ordinary people will be explored. The event will be taking place at Thirlestane Castle in Lauder in the Scottish Borders, on Saturday 24 and Sunday 25 June from 10am. The funding will be used to restore parts of Thirlestane Castle. Management say they hope it will become a ‘Gateway to the Borders’. People are being asked to volunteer ahead of the reopening of a historic castle in the Borders. Thirlestane Castle in Lauder will be open to the public in a couple of months. The volunteer group, Friends of Thirlestane, provide information on the castle's history and the Maitland family who have resided in the castle since 1590 to visitors. Charitable Trust, which own and manage the castle, say they rely on an income from tourists and visitors. The Friends are an invaluable part of Thirlestane Castle. Without them, we would not be able to share this beautiful castle with quite so many people. Volunteers are not required to have previous experience. Car enthusiasts were at Thirlestane Castle in the Scottish Borders today for the 44th Borders Vintage Automobile Club car rally. An estimated seventy thousand people travelled to the grounds for the 10th year at the site. One of the Scottish Borders' most famous castles is due to fully re-open this summer, after extensive restoration work. 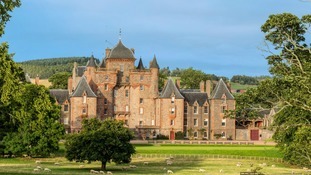 Thirlestane Castle near Lauder closed in 2013 after an outbreak of dry rot was discovered. The building's celebrated plasterwork and furnishings have almost been repaired. Thirlestane Castle in the Scottish Borders has been described as one of the seven great houses of Scotland, and it opens its doors to thousands of visitors every year. However, the castle doors will remain closed to the public this summer, following the discovery of an extensive outbreak of dry rot. "Just at the end of last season we found a dry rot mushroom just at the end of the panels in the dining room. "So as soon as the visitor season had completed we started opening up to find the extent of the damage and I am afraid the opening up went on for quite a long time. "It is only after Christmas and into the New Year that we have really traced the extent of the problem. One of the most popular visitor attractions in the Borders will be closed all summer, following the discovery of a serious outbreak of dry rot. Thirlestane Castle, near Lauder, attracts thousands of visitors each year, and is described as 'one of the seven great houses of Scotland'. The worst affected area is the magnificent dining room in the Castle’s Victorian wing. The affected timber has now been removed from the walls. Trustees expect the cost of the damage will amount to more than £100,000.